A range of 20-30 cheeses are available all year round. These are some unusual ones such as Y Fenni with beer & mustard seed, Harlech – a creamy cheese with horse radish & parsley and then sweeter cheese such as Appledore with apple & cinnamon. There are usually a good range of blue cheese such as Garstang, Blackstick’s, Yorkshire Bue and Shropshire Blue, Long Clawson Stilton and occasionally the Irish Cashel Blue. A fantastic Buffalo Mozzeralla is also stocked with customers rave about. The Snowdonia range has been a very popular introduction including Black Bomber, Red Devil Green Thunder and Pickle Power. Our latest introduction of goats cheese are Irish Goats cheese balls marinated in a garlic and herb oil ~ just to die for spread on oatcakes. Weird?! 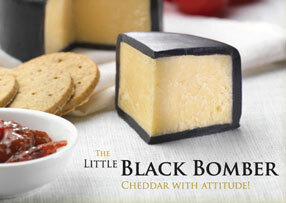 But one of our most popular cheeses! Serve grated over chips! A very mature cheddar with some punch! 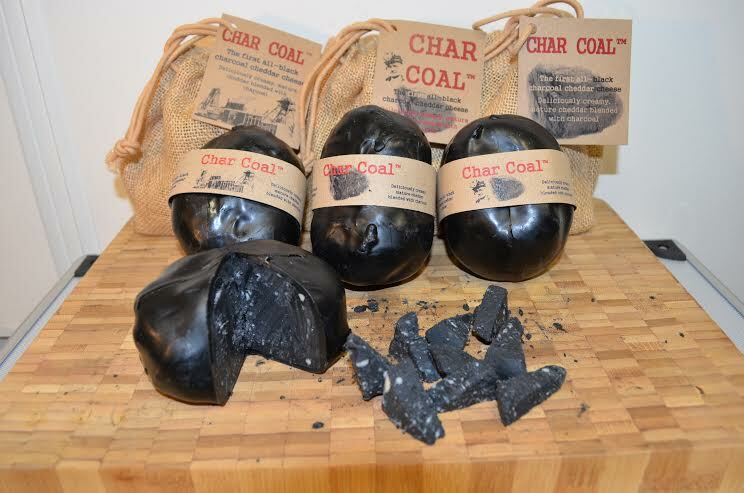 It's black, it certainly won't "brighten" up your cheese board, but adds a new dimension!